The Yamba Lighthouse, also sometimes referred to as the Clarence River Light, is one of the most iconic structures in the town of Yamba. It is located at the end of Pilot Street, on a hill overlooking the Pacific Ocean. It is a popular destination for tourists today, because the grounds have breathtaking views and make a great spot for photos. The lighthouse has a very rich history which dates back roughly 150 years. 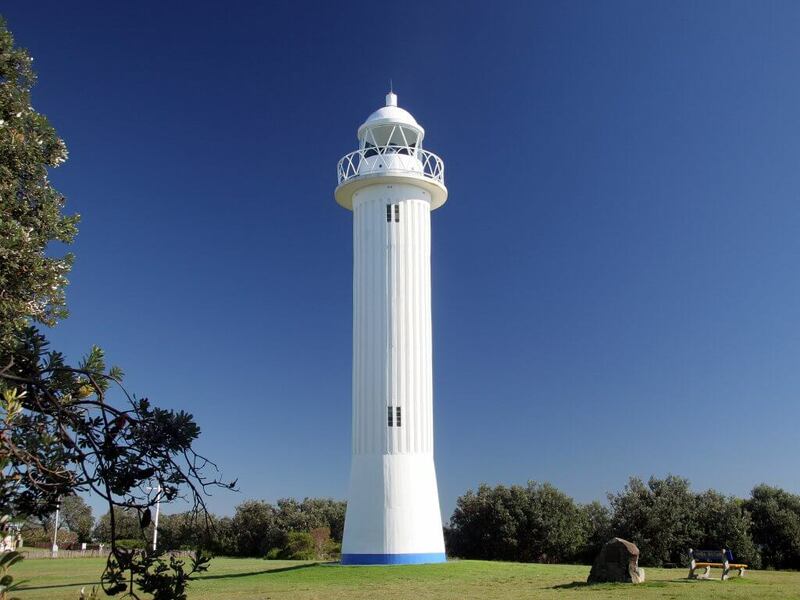 The first lighthouse that was built in Yamba was much smaller than the current light. It was constructed in 1866, and was a wooden house built on a platform that was lit with a kerosene lamp. This lighthouse stood for 12 years, until residents of the town decided it was time for a new, larger lighthouse. The new model was built by W. Kinnear, and construction was finally completed in 1880. The design of this new lighthouse was very similar to the designs of other lighthouses that were built by James Barnet during this time period. This lighthouse measured seven meters tall, and had a roofed porch. Connected to the porch was an annex. The property also had a keeper’s cottage. The lighthouse was manned by a keeper until 1920. At this point, there was enough technology to automate the lighthouse. This structure remained functional until 1955. At this point, the town of Yamba was starting to develop, and some of the buildings in the town were obstructing the light. Specifically, the Pacific Hotel was built in 1934 on the water. The town decided to build a new lighthouse that was better positioned on Pilot Hill in 1955, and the old one was taken down shortly thereafter, in 1956. A water reservoir was then built on Pilot Hill. The 1955 lighthouse is still standing, and it is a completely functional lighthouse. The tower is not open to the public, however, the grounds are open to anyone. While the tower is not open to the public, anyone can visit the lighthouse grounds. The town of Yamba decided to construct a replica of the first 1866 lighthouse in 1980, which was when the water reservoir on Pilot Hill was demolished. Members of the town built this replica themselves with their own money. Improvements have been made to the replica throughout the years, including the addition of a lantern. The replica building is home to one of Yamba’s local radio stations. The Yamba lighthouse is an extremely important part of the town’s history, and is a must-see for any visitor to the town.